Cheap Flights to Copenhagen, Denmark. Return Flights. Copenhagen is the largest city in Denmark: and rightfully so, it is also the capitol. The city is located on the islands of Amager and Zealand and boasts a population of over one million. Copenhagen is one of the most environment friendly cities in the entire world. This city is the most visited city of all the Nordic Countries, drawing over a million tourists a year. It boasts some great architectural sites such as Middelalderbyen, better known as the medieval city. Copenhagen is also known for its horizontal skyline, broken only by spires at castles and churches. 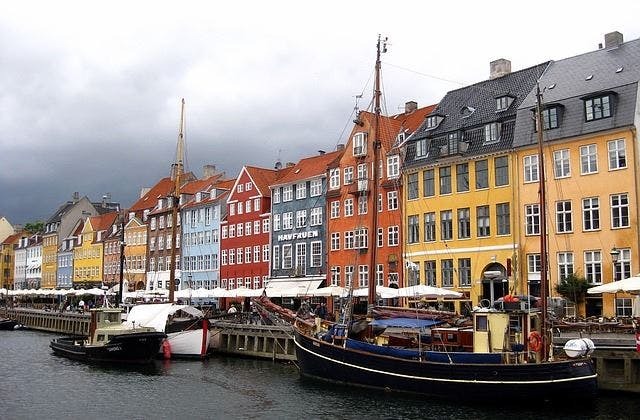 Copenhagen is a great attraction of architectural lovers to get a taste of some of the most beautiful designs. Norwegian Air Shuttle has the slowest flight between Copenhagen and Copenhagen taking 57 hrs 25 mins. Stopping over at Bergen, Stockholm - Arlanda. 64 airlines operate to Copenhagen. To name a few: CSA, Ryanair, Royal Air Maroc, Cathay Pacific Airways, Austrian, Air Baltic, Atlasjet. The cheapest airfare from Adelaide to Copenhagen is $928 on Singapore Airlines. Copenhagen has the International Air Transport Association (IATA) airport code of CPH.